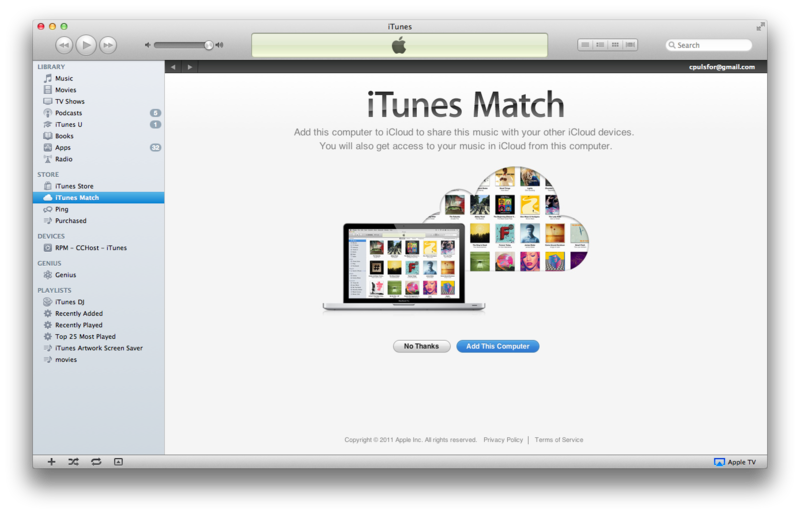 iTunes Match is an iCloud-based music storage service available from Apple. iTunes Match stores your music in iCloud and allows you to play it from Apple devices like the iPhone, iPad, iPod touch or Apple TV, Mac or a PC running iTunes. When you purchase songs from the iTunes store, or import CDs into iTunes, the music will be available on all of your devices and ready to play without syncing. iTunes Match is a feature of iTunes in iCloud that allows you to access your entire personal music library. iTunes Match is limited to 25,000 songs. iTunes Store purchases made with the same Apple ID being used for iTunes Match do not count towards the 25,000 song limit. Unmatched content will be uploaded as is; upload time varies depending on the amounts uploaded and local network speeds. Song files over 200 MB will not be uploaded to iCloud. Songs containing DRM (Digital Rights Management) will not be matched or uploaded to iCloud unless your computer is authorized for playback of that content. When you create, edit, or delete a playlist on your Mac, PC, iPhone, or iPad, those changes will sync across any iTunes Match-enabled device you own. However, playlists with videos, voice memos, or PDF files will not sync. You must use the Apple ID associated with the Savant Master Host to sync iTunes Match content from iCloud to the Savant Master Host. Note - The Apple ID you use for iTunes Match does not have to be an iCloud account. If youve been using a separate Apple ID for purchases, that Apple ID will also work for iTunes Match. You should use the Apple ID that is associated with the majority of your music purchases. Anyone with an Apple ID in the U.S and select other countries can use iTunes Match. You also need iTunes 10.5.2 or later on your Mac or PC and iOS 5.0.1 or later on your iPhone 3GS or later, iPod touch (3rd and 4th generation), or iPad. iTunes Match can handle the following music formats: AAC, MP3, WAV, AIFF, Apple Lossless, and more. You can match or upload music formats that can be played with iTunes. iTunes Match supports up to 10 devices, this includes your computer, iPhone, iPod touch, iPad, and Apple TV. 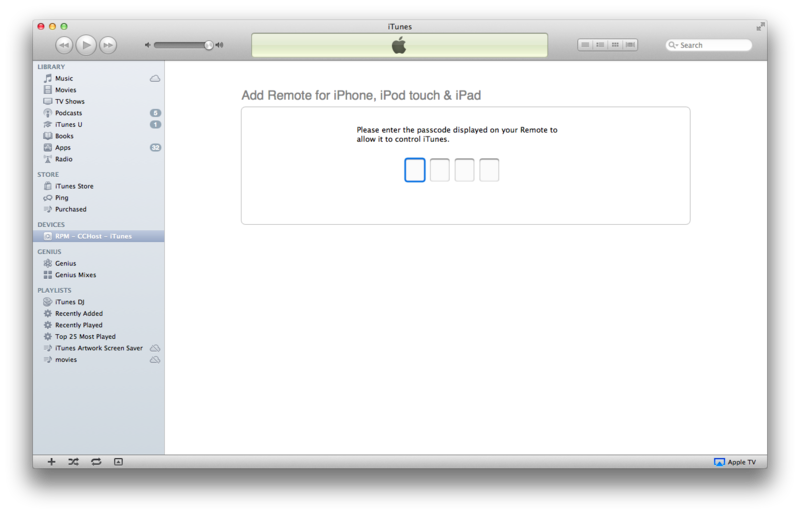 Note - The Savant Master Host is also considered an iTunes Match-enabled device, and must be included in the pool of 10 devices. Also, Savant leverages AirPlay therefore any Apple TV in your configuration does not need to count as a device. Music synced from iCloud to the Savant Master Host is downloaded (not streamed) to an internal or external HDD associated with the Savant Master Host. It is automatically downloaded to the internal or external HDD or NAS associated with the Savant Master Host and available for playback. Parental Controls are handled through iTunes Preferences and also on the iOS devices via settings. These individual Savant Master Host Controllers can simultaneously sync up with any new playlist, content etc. from the iCloud. You would need four Savant SmartSystems each installed at each location and configured with the same iTunes Account on the Savant Master Host. The Savant Master Host at each unique location would act as an iTunes Match-enabled device. 1. Make sure you are on an iTunes version of 10.5.2 or later. 2. Under the Store menu, select Turn iTunes Match On. 3. With iTunes Match now enabled, click iTunes Match on the left hand side of the iTunes window and click either Add This Computer or Subscribe as shown below. 4. These actions will start the iTunes Match process, which uploads your local library into iCloud. 1. Screen share with the Savant Master Host. 2. Open up iTunes and navigate to Preferences. 3. Under the Devices tab make sure the box labeled Allow iTunes audio control from remote speakers is checked as shown below. 5. While the Savant software is running, look for a remote on the left hand side of iTunes screen labeled RPM - name of your host - iTunes as shown below. 6. Select it and enter four zeros as the pairing code. After the above steps have been completed, any time your iCloud is updated from any of your devices our software will download the new songs so that they are available for playing through your Savant System. This FAQ describes frequently asked questions and answers related to iTunes and how it interacts with Savant hardware and software. Q: How do i adjust the volume level on iTunes streams that are louder than other sources? Within the file, put a value from 0.0 (silence) to 1.0 (full volume). Save the text file in /Library/Application Support/RacePointMedia/statusFiles/ on the Host. Q: What is the playlist called "_SAVANTSYSTEMS_" that keeps appearing and disappearing on the Host iTunes? A: iTunes Match will only update if it detects a change in the iTunes library. Savant Systems creats an empty playlist which forces the change. Q: iTunes streams sound distorted, what could cause this? A: If Bass and Treble settings are turned up all the way this could cause distortion of the iTunes streams. Adjust the settings more carefully within System Monitor. These settings are located in System Monitor by double clicking on your host and then clicking on Audio Settings. The settings can also be adjusted via the iPad® within the audio settings area. Q: What is the iTunes Match 90 day lockout? A: The message "This computer is already associated with an Apple ID. You can use iTunes Match on this computer with just one Apple ID every 90 days. You cannot associate this computer with a different Apple ID for 21 days" appears. iTunes Match will only allow one match account to be set up on a single computer or device every 90 days. After the 90 day lockout passes, another Match account can be set up, however it begins the 90 day period again. Q: How many iTunes accounts can be held on a system? A: Only one iTunes account can be a associated with a Savant system. If you have songs from any other iTunes account, they will show up in the library, but will not be able to be played through the Savant system. However, there are a few solutions to this problem. You could contact Apple and ask them to merge your multiple accounts to a single account that can be authorized on the Host Mac mini. Export the music from the account that will not be authorized on the Host Mac and import it into the account that will be authorized. Remove the songs of the unauthorized iTunes account from the Host Mac if you dont care about them. This will ensure that no unplayable songs are listed. Q: Does the Savant Media Server support International iTunes Accounts? A: Yes, the Savant Media Server supports International iTunes Account. Q: What do the iTunes Match cloud status icons mean? Ineligible This icon is displayed next to items that are not eligible to be uploaded to iCloud via iTunes Match. Some examples are songs that are larger than 200MB or songs encoded at 96 Kbps or less. Removed This icon is displayed when a song has been removed from iCloud (from a different computer). Songs deleted from iCloud are immediately deleted from associated iOS devices, but will remain on other associated computers until they are manually deleted. Error This icon may be displayed if the song file is corrupt or if there was an error uploading the song. Try updating iTunes Match (Store > Update iTunes Match) to resolve this. If updating does not resolve the issue, try importing a new copy of the song into your iTunes library. Duplicate This icon is displayed when a duplicate version of this song exists in your iTunes library on your computer. This icon will be displayed next to duplicates that were not uploaded to iCloud. Waiting This icon is displayed when a song is in the process of being matched, but has not yet been processed. Q: iTunes Match "waiting" status on song download has caused library to stop downloading. What can I do to fix this? A: See iTunes Match Waiting Status on Song Download Application Note. Q: iTunes match does not auto download what should I do? Check to make sure match does work. Check to make sure you've paired the remote. Make a change to the database by clicking to download a song. iTunes mach will start a re-sync and should start to download. Q: iTunes match freezes at step 3 when uploading to iCloud. How can I resolve this? In iTunes, navitate to View > View Options. In the View Options window, enable iCloud Download and iCloud Status then click OK. This will enable the iCloud Status icons to be visible in the Music Library. In the Music Library, locate any media that has an iCloud Status of Error. Either delete the corrupted media or repair with third party software. Stop the iTunes Match process then restart it. Q: Does Savant support Smart Playlists? A: Yes, Smart Playlists in iTunes are supported. Smart Playlists will add songs to the playlist as they are added to the iTunes library, as long as they fit the designated criteria. Q: How do I set up the Media Drop Box on the end users Lion machine? Go into the Finder Preferences to enable visibility to Connected Servers. In finder connect to the Media Drop Box as RPM/RPM, or whatever password has been set. Change the finder preferences to show connected servers on the desktop. Ensure that the Media Drop Box is an enabled login item in users and groups. Q: Does SAVANT support NAS Drives for iTunes Media Content Storage? A: Yes, see Does SAVANT support NAS Drives for iTunes Media Content Storage for instructions on how to set it up. Q: How can I remove DRM (un-protect) iTunes Music? Delete the original DRM song from the library first. Doing this enables a download of the song again in the iTunes Plus format from iTunes in the Cloud. Click the Purchased tab in the iTunes Store. Locate the artist of the song you want to upgrade. Click the iCloud Download icon next to the song you want to upgrade. Q: Which Savant Hosts support iTunes Digital Audio Service through the Headphone Output Port? A: The HST-3001 or HST-4001 hosts have the ability to support iTunes Digital Audio Service through the headphone out port in either analog or digital format. An adapter is needed to use the digital capabilities of the headphone out port. Q: After updating to da Vinci 5.0 or higher, iTunes music dissappeared. I'm being asked to recreate or choose a new library, what do I do? A: See Recover iTunes Library After da Vinci 5.x Upgrade. Q: User gets stuck when tyring to AirPlay iTunes to an Apple TV. How do I resolve this? 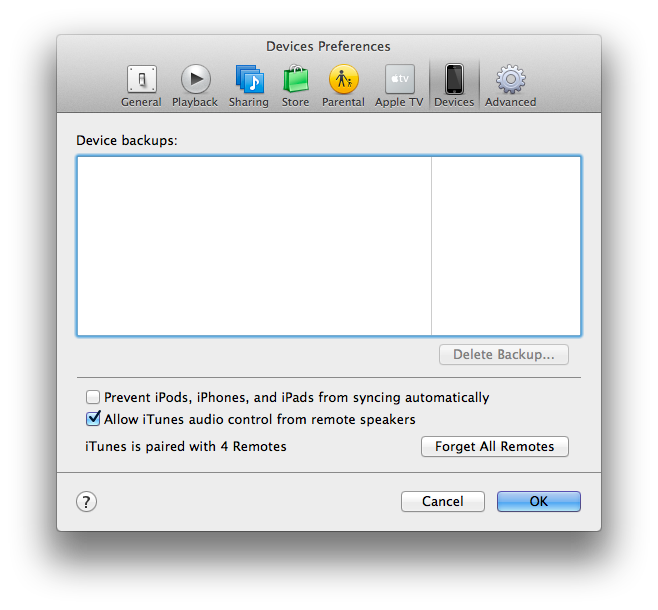 A: See iTunes won't AirPlay to an Apple TV to resolve the situation. Q: How may iTunes streams can a WCS-1000 output? A: The WCS-1000 can output one stream of iTunes audio.